Here it is at last. After this we finally take up the new update schedule properly (it was supposed to start December but the Holidays and Devmas did that in pretty thoroughly - for the best we'd all agree I'm sure). A reminder of what that is: from now on, updates are bi-weekly. First and third Wednesday of the month. And now, what do you think of Patchwork? My personal theory: She's some variety of plush golem. I'm probably going to be such a Patchwork fanboy. And by probably I mean almost certainly. I do have to wonder if she has a lot to lose as her civilian persona, hence fighting so vehemently to avoid capture. Perhaps the whole Patchwork persona is her way of living out another side of herself that she cannot afford to show in her "secret identity". Then again, a criminal not wishing to be captured is scarcely unusual. Last but not least, I'm also curious if CapeChasers will become a real website / lexicon / wiki. Very cool. Reminiscent of Ragman, who I always thought was interesting. Holy fricking yes it does! Be awesome if the "driving animus" behind Patchwork wasn't the "person" under the costume or even the "patches" of fabric, but instead was ... 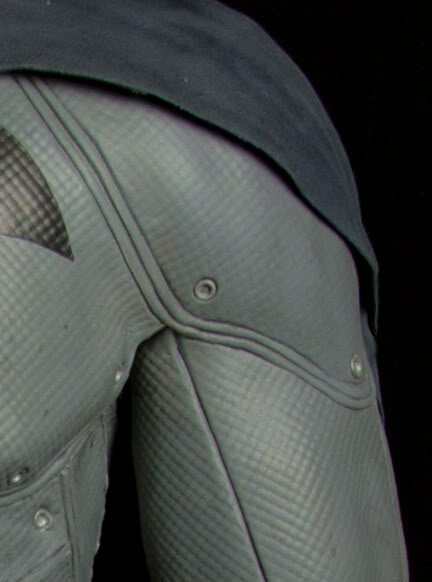 THE STITCHING. The "patchwork" of cloth is just there to give the stitching that holds the cloth together a coherent "form" to present. Then again, I may be suffering from an overdose of Studio Trigger, Kill La Kill, and a paranoia about Life Fibers (which are really out to get me!). Hehe. She'd better watch her back, or Alice Valentine, a/k/a "The Queen of Hearts," might pay her an unexpected visit. Glad I was not the only one who thought of Ragman or Ragdoll who was my first one that came to mind. On that note is a batman like villain? I read it and all I can think of was someone who would have been locked away in Arkham Asylum at some point. I like her, and these theories about the source of her powers. Her powers and persona are in no way derivative, but as I was reading her description I immediately thought of "The Mahdoubt" from the final Thomas Covenant series. Good point, and it makes me want to clarify to make sure what I said didn't come across different than I meant for it to. By reminiscent I meant "in the same vein as" in a good way, not derivative. I think almost everything in a Superhero MMORPG is going to be somewhat of an homage--at least if it's good. There have been literally THOUSANDS of Superheroes since the early to mid 1900's depending on where you draw the line at "Superhero". The chance that anyone is going to come up with something that is totally new under the sun and never-been-done-before that is also good is close enough to nil that it just ain't gonna happen much. Statesman, who I really liked as an iconic flagship, was sort of a Shazamtain America with a few nice twists--which I thought was awesome. My mains tend to be pastiche homages to types of heroes I tend to like. Anyway, I'm digging all of the lore so far. I think it's spot on for tasteful twists on classic comic themes. And all this time I thought it was Hobina Ruds. My thoughts were "it's a telepresence". I think there's a person using magic to control the "suit" from a distant location, who can see and hear what's going on around it. There's too much personality for it to simply be an automaton. "Not an automaton" does not preclude "not a construct". There are several examples of constructs with personality in superheroic and other speculative lore. I'm not understanding what you're saying. 1. Too much resilience/ability to be a person in a suit; so it's a construct of some sort. 2. Too much personality to be an automaton; so a person is giving it emotive reactions. Therefore, Patchwork is a remotely controlled construct. Of course, your point about this being comics is a good one. It's certainly possible that my assumptions 1 or 2 don't hold. We could have a Superman-type hero who's costume got Super-glued on. We could have clothing animated by the unrequited dreams of an insane fashion designer. Who knows? ( ;) ) Anyway, I've made my guess. I was using "person" in the colloquial sense of "human being", rather than the legal sense of "entity with legal rights". Wasn't there this story about a rag soaked in peculiar chemicals that smothered people while they were sleeping? Oh, yeah, the cleaning rag that fell behind the radiator. It's become humanoid? I like the idea that the costume is a symbiont of some kind. heh... as long as its not Kevlar'ed Patches?